Simple, visible and striking, star tattoos on the wrist can be a great way to show off a number of traits. No matter what style of star you're planning, the wrist can be the perfect spot to make sure it gets noticed. The wrist is an extremely popular place for some types of tattoos. No matter if the tattoo is adorning the back of the wrist, the inside of the wrist, or circling it, there is no denying that placing a tattoo in this area helps make a statement. A tattoo on your wrist is visible to everyone, both you and your admirers. If you speak with your hands, have an expressive personality or just want to show off your design, a wrist tattoo is the way to go. The wrist is a fairly small, finite area. Tattoos such as stars are perfect for the wrist, since the design can fill the entire area without overwhelming it or looking out of place. Wrists don't undergo major changes as you age. They may swell or shrink slightly, but they aren't as affected by rapid weight gain or loss as some other body parts. A tattoo on the wrist is unlikely to become overly stretched or distorted. Since the wrist is so visible, it makes sense the tattoo you place there should say something about you. Several different types of available star designs work well in this area. With its alternating colors and three-dimensional design, a nautical star tattoo on the wrist can really pop. Whether it symbolizes the compass, or the punk rock movement be sure to show it off with vivid colors and crisp lines. While the wrist is a small area, you do have access to the forearm as well for tattoos with a tail, such as a shooting star. Whether you're using a cluster of small and brightly colored stars, or a large comet, it makes the statement that you're going places with a shooting star on the wrist. Evenly spaced, small stars that circle the wrist can give the appearance of a bracelet with a little more pizzazz. Rather than connecting the stars, let the eye do the work and join up the design visually. Use all black, or a variety of colors to make the design standout. Are you in the medical field and proud of what you do? Show it off to everyone by placing a star of life tattoo on your inner wrist. This placement allows you to turn it in towards yourself, to keep it more private while still showing your passion. If the image of the star is what's important to you, make it stand out by creating a star within a star. 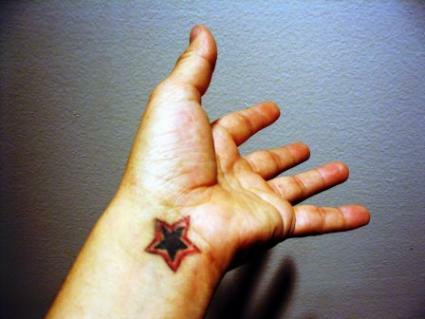 Two outlines, one thinner star wrapping around the thicker one with an open middle will draw attention to the tattoo, creating a small optical illusion. The inner star will pop out a bit from the outer, catching the eye. There's no reason that a star tattoo must be only outlined or in a solid color. Try different shading techniques to create a design that's totally yours. Gently shade each point of the star so it lightens toward the middle, or create a slightly different nautical star design with lighter and darker shades of the same color and no hard divides between them. The viewer will need to look closer to see the final image, and your wrist is the perfect place to bring it to their attention. Star tattoos on the wrist can show off your playful, serious or passionate sides. No matter what the image of the star means to you, make sure you and everyone else can see it by locating it on the wrist.